Turn your backyard into an enchanting butterfly haven with this hanging butterfly house by Schrodt Designs. Built of solid redwood with brass components, it has a diameter of 7 inches and is 17 inches tall. 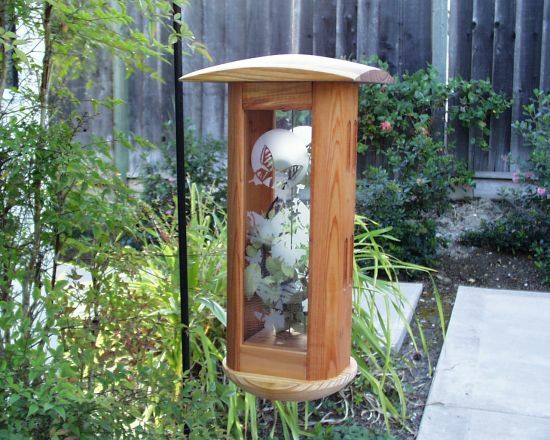 The roof of this butterfly box lifts open for easy cleaning. Two sides feature large panes of beautifully etched glass, which allows you to easily view the butterflies without disturbing them. The other sides have slots that allow butterflies to enter and exit, but keep predators out. To attract butterflies to your garden, the manufacturer suggests placing the house in a shady place, near water and flowers. The house can also be used as a nursery for caterpillars to transform into butterflies. Treat yourself to the serenity of a butterfly sanctuary, right in your very own backyard.